Glamorgan have revealed a loss for 2018 of £365,000 in the county's annual report to members. A deficit had been forecast for the year, in which Glamorgan staged just two days of international cricket at Sophia Gardens. It takes their overall debt to £2,754,000, but the county hope to record a profit in 2019. Sophia Gardens will host four World Cup matches and an England T20 international this summer. The 2018 loss follows recent trends in the county's finances depending on the number of international games, with seven-figure profits recorded in 2015 and 2017, but a similar loss of £308,000 in 2016. 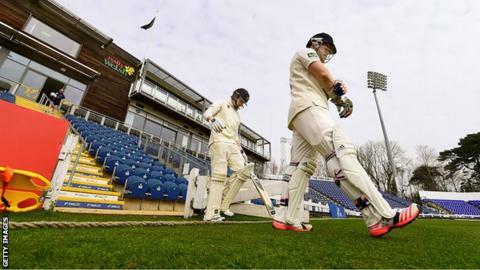 Glamorgan hope to be debt-free by 2025, partly thanks to becoming one of the host venues for the ECB's controversial new 100-ball tournament in 2020. The club will increase spending on the cricket side from £2.2m to £2.5m in 2019, after finishing bottom of the Championship, failing to make progress in the T20 Blast and winning just one One-Day Cup game. "2018 was a bitterly disappointing season for everyone at Glamorgan.. a season which started with such promise, with a hard-fought victory at Bristol, soon led to frustration," admits chief executive Hugh Morris in his report to members. He says having to tell head coach Robert Croft that he would be replaced was "one of the toughest days" of his career. "There has been no prouder Welshman to wear the daffodil than Robert Croft, and it was with an extremely heavy heart that the Board decided that a change of head coach was required." Matthew Maynard will take Glamorgan into the new season as interim head coach, while Mark Wallace took over from Morris as Director of Cricket in February. Morris's report will go before members at the club's AGM on 26 March.